In Part 1 of the UCAT Guide, we explain what Verbal Reasoning is and how to solve UCAT Verbal Reasoning problems. What is Verbal Reasoning in UCAT? The Verbal Reasoning section is the first of the five UCAT subtests. It assesses your ability to read a passage of information and determine whether a specific conclusion can be drawn. Why is Verbal Reasoning tested? Doctors, dentists, and/or medical professionals require excellent verbal reasoning skills to receive complex details, understand the information, and then communicate this clearly to patients. In Verbal Reasoning, candidates need to make inferences and draw conclusions quickly. Medical practitioners also need to be able to read medical publications and apply the findings to their own practice. They also need the ability to critique information presented in medical publications and draw their own conclusions regarding the validity of the findings. What is the format of the Verbal Reasoning subtest? This subtest is one of 5 subtests within the UCAT and comprises of 11 passages of text with each passage followed by 4 questions. These 44 questions are to be completed in 21 minutes. Some of the questions assess your critical reasoning skills where candidates will need to make inferences and quickly draw conclusions from provided information. First, you’ll need to read the passage and understand the information. Next, you’ll have to answer a question or incomplete statements and choose from four response options. You’ll have to select the most suitable or best response and can only select one response. What are the types of Verbal Reasoning questions? The flowchart below illustrates the different categories in the Verbal Reasoning subtest. 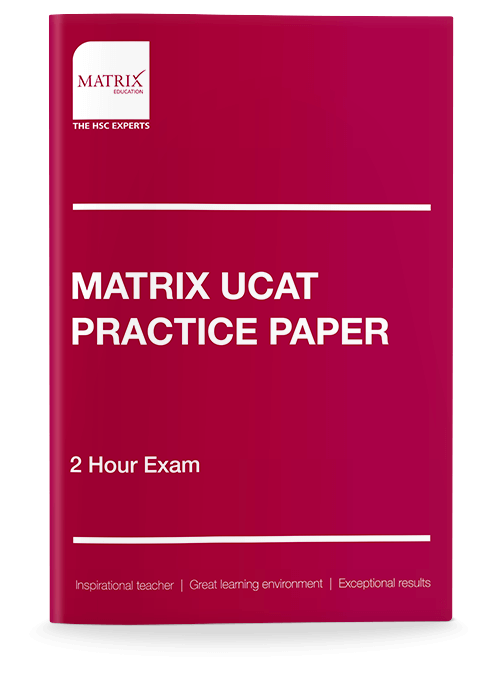 You can assess your Verbal Reasoning skills with the Matrix UCAT Practice Paper. We suggest that you read the 5 different types of Verbal Reasoning sample questions below before attempting the UCAT Practice Paper. The productivity of an olive plantation can be maximised through appropriate preparation of the soil in advance of planting. This will give newly planted trees the highest probability of survival and will allow them to grow at a maximum rate. Preparation should begin three months prior to planting. A soil test should be conducted to identify contaminants or mineral deficiencies and to test the soil pH. In the absence of contaminants, the soil should be ploughed and one level wheelbarrow of cow manure should be spread over an area of two square metres around each tree site in order to increase soil fertility. Half a wheelbarrow of blue metal stone dust may be spread over the same area to increase the mineral content of the soil. Ideal pH is between 6.5 and 7. Soil pH can be adjusted through the use of lime over the entire field if required. Soil pH below 5.5 may be lethal to the trees and must be raised prior to planting. Trees should be planted in rows oriented along the north-south direction. A space of 8 m should be allowed between rows, and of 6 m between each row. This will allow maximum air circulation and will reduce shading. Cultivated varieties are generally frost and drought resistant. Once trees are planted at the beginning of spring it is important to apply a phosphorus-based fertiliser. Trees should receive 9 L of water weekly for the first six months as they become established. In the longer term, rainfall should be monitored and the trees should be watered accordingly. The pH should be retested after two years and adjusted if required. Following these instructions should allow trees to grow by 1 m in the first years under optimal conditions. Olive trees require 9 L of water per week to grow at an optimal rate. The instructions only specify 9 L per week for the first six months. In the longer term, it says watering should be adjusted for rainfall but the total amount per week is not specified. These type of questions aren’t written as questions. You’ll need to identify the most appropriate response that best completes the statement provided. (A) Require 9 mm of rain per week when first planted. (B) Do well in low pH soil. (C) Are hardy and will do well in adverse conditions. (D) Require 48 square metres per tree. The third paragraph states that trees should be spaced 8 x 6 m apart, hence they require an area of 48 square metres. Option A is incorrect as the passage states 9 L per tree per week, not 9 mm of rain per week. Option B is incorrect as trees cannot grow at pH below 5.5. Option C is incorrect as the third paragraph states trees are tolerant to drought and frost, but does not say they will thrive in those conditions. These type of multiple-choice questions reiterate the need for you to only use the provided information without being influenced by any prior knowledge or opinions. Option C is the answer as the end of the second paragraph states that pH below 5.5 may be lethal, hence adjusting the pH, in that case, is necessary. The passage says pH “can be adjusted” and, so, does not say it is required in other cases. These type of questions requires you to review evidence to come to a conclusion. Applicants will need to select the most appropriate answer given the information in the passage. (A) The cow manure should be applied in early winter. (B) Following the instructions ensures trees will grow by 1 m in the first year. (C) The phosphorus-based fertiliser is added separately to the lime. (D) Ploughing is the first step in soil preparation. Option B is the answer as the initial paragraph says trees are given the highest probability of survival, and the final paragraph says “should allow” trees to grow by 1 m under “optimal conditions” but does not specify what these other conditions are. Hence, trees are not guaranteed to grow by 1 m.
Option A is true as planting is in early spring and preparation starts three months prior. Option C is true as the lime is applied as part of the preliminary preparation and the phosphorus-based fertiliser is applied after planting. Option D is true, in the second paragraph ploughing is the first step of preparation. The soil test does not prepare the soil. In these type of questions, the multiple choice response options are less definite and more speculative but choices will be as clear as in other questions. After reading the passage, you’ll need to weigh up the evidence to reach a conclusion. If the instructions in the passage are correct, which of the following statements is most likely to be true? (B) Sufficient time must be allowed between preparation and planting. (C) Soil pH will change after two years. (D) The trees’ growth will be maximised if maximum sunlight is received. The instructions indicate that preparation should start three months prior to planting, so it is inferred that time is required between preparation and planting. There is insufficient information to decide whether option A is true, the phosphorus-based fertiliser is described as an important step but many steps are given and it is impossible to tell if it is the most important. Option C is not necessarily true, the instructions indicate that soil pH should be tested, not that it will have necessarily changed. Option D seems sensible, but the amount of sunlight is not discussed in the passage hence no inference can be made. The passage refers to reducing shading, rather than maximising sunlight.